Free-Staters was the name given to settlers in Kansas Territory during the "Bleeding Kansas" period in the 1850s who opposed the extension of slavery and were in favor of individual liberty. The name derives from the term "free state", that is, a U.S. state without slavery. Another name many Free Staters from Kansas took on was Jayhawker. Many Free-Staters were abolitionists from New England, in part because there was an organized emigration of settlers to Kansas Territory arranged by the New England Emigrant Aid Company beginning in 1854. Other Free-Staters were abolitionists who came to Kansas Territory from Ohio, Iowa, and other midwestern states. Holton, Kansas was named for the Milwaukee, Wisconsin free-stater Edward Dwight Holton. What united the Free-Staters was a desire to defeat the southern, pro-slavery settlers in Kansas Territory on the question of whether Kansas would be admitted to the Union as a slave state. (The Kansas–Nebraska Act of 1854 had left the question open to the settlers in the territory.) Bastions for the free-state movement in Kansas included major towns and cities like Lawrence, Osawatomie, Manhattan, and Topeka, among others. As time passed and the violence in Bleeding Kansas escalated, the Free-State movement became more popular. 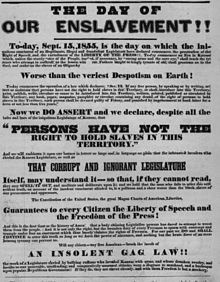 In 1858, the Free-Staters proposed a second constitution, the Leavenworth Constitution, which banned slavery and also would have given the right to vote to black men, though this constitution also failed because the US Senate did not ratify it. Kansas became a state in 1861 after a free state constitution (from a conference in Wyandotte in 1859) was agreed upon. ^ "Honorable E. D. Holton: He Visits our Young City Amid the Firing of Cannon, The Ringing of Bells, Playing of Bands, And Rejoicing Generally". Holton Recorder. Holton, Kansas. December 11, 1879. Retrieved February 18, 2013. ^ Gilman, A. F. (1914). The Origin of the Republican Party. Ripon, Wisconsin: Ripon College. pp. 5–10. Retrieved August 2, 2018. ^ Cordley, Richard (1895). A History of Lawrence: From the Earliest Settlement to the Close of The Rebellion. Lawrence, KS: E. F. Caldwell. pp. 1–3. ^ Prichard, Jeremy (2013-04-22). "New England Emigrant Aid Company". Civil War on the Western Border. Kansas City Public Library. Retrieved 2018-08-02. The Northern settlers, who began arriving in 1854, founded various towns such as Topeka, Manhattan ... Osawatomie [and] Lawrence. ^ "Leavenworth Constitution". Kansas Memory. Kansas Historical Society. Retrieved August 2, 2018. ^ a b "Kansas Constitutions". KSHS.org. Kansas Historical Society. Retrieved July 6, 2018. Miner, Craig (2002). Kansas: The History of the Sunflower State, 1854-2000. Lawrence, KS: University Press of Kansas. ISBN 0-7006-1215-7. Reynolds, David (2005). John Brown, Abolitionist. New York City, NY: Knopf Doubleday Publishing Group. ISBN 0-375-41188-7. Thayer, Eli (1889). History of the Kansas Crusade: Its Friends and its Foes. New York City, NY: Harper and Brothers. Retrieved August 2, 2018.